The victim’s vehicle was vandalized while parked on the roof of the Tenth Street & Cherry Street parking garage between 9/14/17-9/17/17. The driver’s side window was shattered. 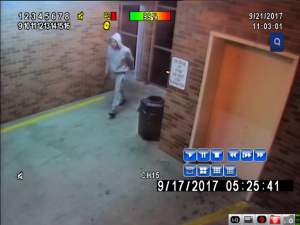 Surveillance video from the parking garage shows these two as possible suspects. If you have any information on the identities or whereabouts of these individuals, please call CrimeStoppers at (573) 875-8477.